Jesu, nun sei gepreiset (Jesus, now be praised), BWV 41,[a] is a church cantata by Johann Sebastian Bach. He composed the chorale cantata in Leipzig for New Year's Day, the feast also celebrated the naming and circumcision of Jesus, and first performed it on 1 January 1725. It is based on the hymn by Johannes Hermann (1591). That year, Bach composed a cycle of chorale cantatas, begun on the first Sunday after Trinity of 1724. The cantata is based on the hymn for New Year's Day in three stanzas by Johannes Hermann (1591) who was also a Thomaskantor. Its melody is by Melchior Vulpius, who first published it in his Ein schön geistlich Gesangbuch, printed in Jena (1609). The hymn calls Jesus by name first, fitting to the celebration of the naming. Otherwise it is more concerned with the beginning of the New Year. It was popular in Leipzig and was used in two more of Bach's cantatas for the occasion, Singet dem Herrn ein neues Lied, BWV 190 and Gott, wie dein Name, so ist auch dein Ruhm, BWV 171. An unknown poet kept the first and the last stanza as movements 1 and 6, and paraphrased stanza 2 to a sequence of alternating arias and recitatives, expanding the 14 lines by additional ideas, but not specifically referring to the gospel. In the opening chorus, a chorale fantasia, Bach faced the problem of structuring the unusually long stanza of 14 lines and an additional repeat of the first two lines, as seems to have been customary in Leipzig. The concerto of the orchestra is dominated by a syncop fanfare motif from the trumpets. In the first four lines, repeated in the next four and the final two, the soprano sings the cantus firmus, with the lower voices in free polyphony. Lines 9 and 10, speaking of "in guter Stille" (in good silence) are marked adagio; the choir sings in homophony in triple meter, accompanied by the orchestra without the trumpets. Lines 11 and 12, repeated in 13 and 14, are a presto fugato, with the instruments playing colla parte, expressing "Wir wollen uns dir ergeben" (We want to devote ourselves to you), an "enthusiastic rededication to spiritual values". The fugal subject is derived from the first phrase of the chorale melody. Lines 15 and 16 repeat lines 1 and 2, saying "behüt Leib, Seel und Leben" (Protect our body, soul and life). In contrast, both arias have been described as chamber music. 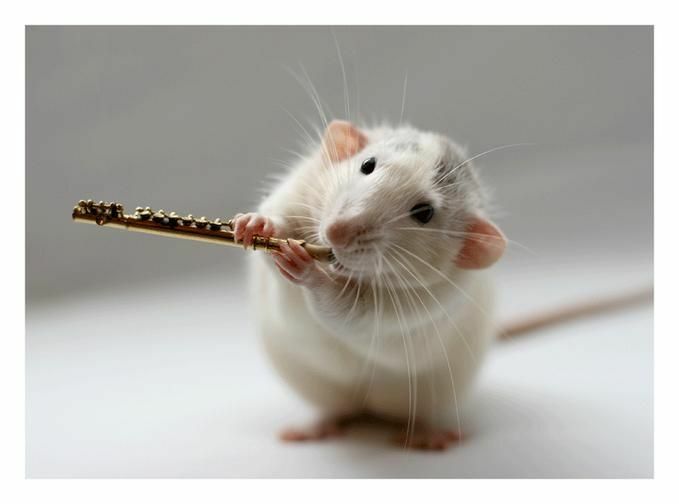 The first aria is sung by the soprano, accompanied by three oboes in pastoral 6/8 time. A short secco recitative leads to a tenor aria, which is dominated by an obbligato violoncello piccolo in expansive movement. The last recitative for bass contains one line from Martin Luther's Deutsche Litanei (German litany), which Bach set for four-part choir, marked allegro, as if the congregation joined the prayer of the individual. The closing chorale corresponds to the first movement. 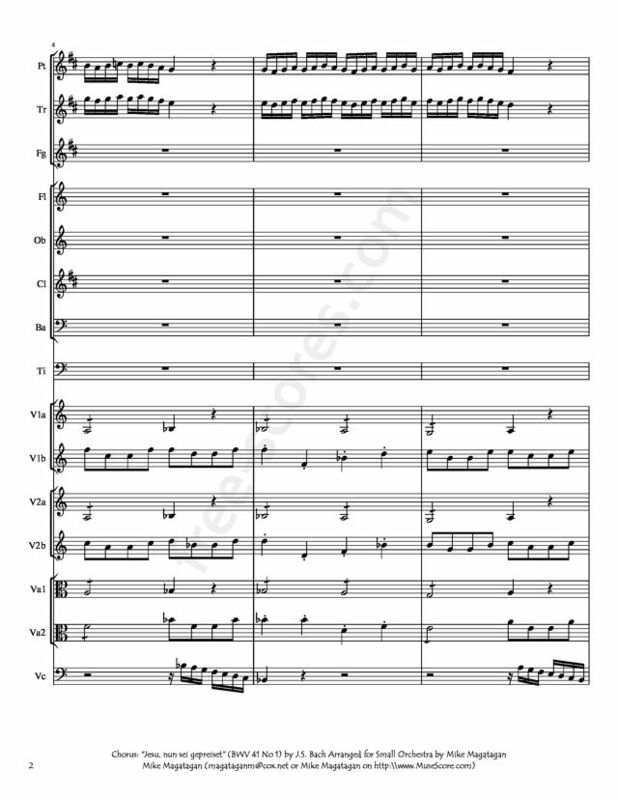 The lines are separated several times by its trumpet motif; the trumpets are silent in lines 9 to 14; lines 11 to 14 are in 3/4 time; the final fanfare recalls the beginning. John Eliot Gardiner notes that Bach achieves a suggestion of the year's cycle by ending both the first movement and the end of the cantata as the work began, as a "closing of the circle". 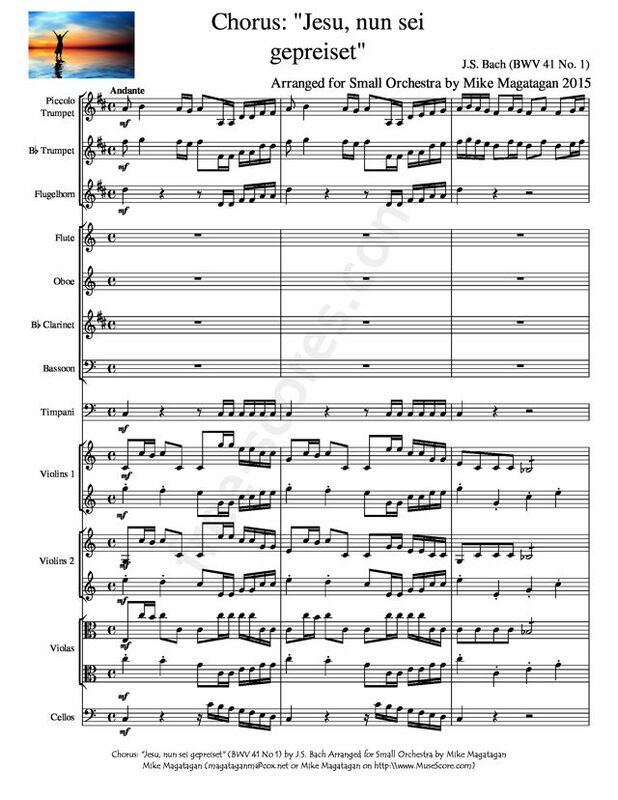 The cantata in six movements is scored for four soloists (soprano, alto, tenor and bass), a four-part choir, three trumpets, timpani, three oboes, two violins, viola, violoncello piccolo da spalla and basso continuo. 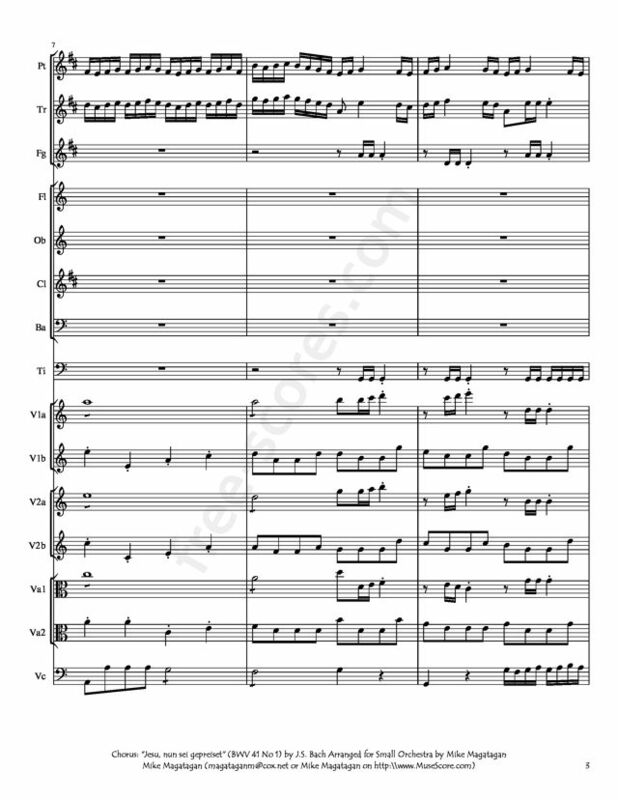 I created this arrangement of the opening Chorus: "Jesu, nun sei gepreiset" (Jesus, now be praised) for Small Orchestra (Bb Piccolo Trumpet, Bb Trumpet, Flugelhorn, Flute, Oboe, Bb Clarinet, Bassoon, Timpani, 4 Violins, 2 Violas and Cellos).